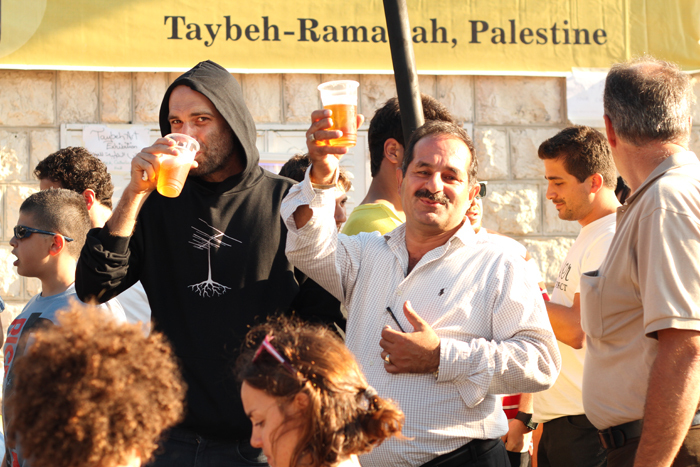 Nadim Khoury (raising his glass) is the brewmaster at Taybeh Brewery in the West Bank. High in the hills of the West Bank, Palestinians hold one of the world’s most unlikely Oktoberfests. Each year, thousands of Palestinians and foreigners descend on the sleepy village of Taybeh to hoist pints, eat local food and even play a round or two of street hockey. Since 2005, the Taybeh Brewery—named after the village—has been hosting its very own Oktoberfest. Rather than bratwurst sausages and sauerkraut, the stalls here serve falafel, shawarma and manoucher—traditional bread baked and served with cheese and the Palestinian spice za’atar. And while the beer is served in German tradition, poured from ice-cold kegs, Khoury says Taybeh’s Oktoberfest is a chance to showcase Palestinians’ national products. “It’s also a way of sharing our culture and heritage and national costumes that Palestine has, and it gives venue to different artists to share their skills, talent and music,” Khoury says. There is live music throughout the day, and a couple of Canadians even organize a mini street hockey tournament. As the sun falls on this hilltop festival, the grounds become so crowded it’s difficult to reach the taps for another round. A performance of classic Palestinian dabke dancing is followed by well-known Palestinian hip-hop group Da Arabian MC’s (DAM). “This is part of our nonviolent resistance under these harsh conditions, closed in behind the wall,” Khoury says. When Maria’s husband, David, and his brother, Nadim, started the Taybeh brewery almost two decades ago, few thought that they could make a viable brewery in the occupied West Bank. In 1994, Nadim’s father persuaded him to return to his native Palestine. A year later they started the brewery. That first year the brothers brewed just 500 liters, but last year they brewed over 6,000 hectoliters. About 10 percent of that is exported to Germany, Belgium, Sweden and Japan. Nadim says that there are only a few specialty shops and pubs that offer it in the United Kingdom and United States but that they are looking to break into these markets. He stresses Taybeh is a microbrewery—quality not quantity— and the family isn’t looking to move to mass-scale production, but rather keep Taybeh as a handcrafted boutique beer. Currently, Taybeh produces five types of beer—golden, amber, dark, light and non-alcoholic, popular in the territory where the majority of the population is Muslim. This year they are developing a sixth brew—Taybeh White—a light summer beer brewed Belgian-style and spiced with orange peel and coriander. It will be the first time Taybeh uses a rich portion of the local wheat along with the Belgian and French wheat, which the brewery imports for its other labels. Nadim says while Taybeh is a truly Palestinian product, that fact that it’s the first and only brewery in the Palestinian Territories means they’ve had to rely on imports to brew in accordance with German Purity Law of 1516. “We buy the hops from Bavaria and the Czech Republic,” Nadim says. While Taybeh has managed to carve out a niche market, locally and abroad, Nadim says they faced plenty of challenges. Low on cash, the brothers set up the brewery on their family’s land. They still brew in a small factory steps from Nadim’s home. Beyond financial backing, Nadim says brewing under military occupation has its own unique challenges. The brewery opened just after Israeli and Palestinian leaders signed the Oslo Peace Accords. There was an air of optimism in Palestine and a feeling that Palestinians were finally on the cusp of peace and statehood. But within a few years, that optimism was crushed as the Second Intifada (uprising) swept across the territories, and Israel intensified its military occupation.